FAIRFIELD — Bluebird Meadow; the name just sounds inviting, a reminder that spring has arrived and warmer weather will soon follow. The bright blue birds are indigenous to Connecticut and do not migrate south for the winter. They are found here year-round including on the enchanting property at 1381 Old Academy Road, which was named Bluebird Meadow by a previous owner. With 3.6 acres on this corner lot, much of it meadows, there is ample space for birds, other wildlife, and humans, who can enjoy the serene setting from the red brick patio in the backyard. The 3,520-square-foot house is in the Greenfield Hill neighborhood within easy walking distance of another obvious reminder of spring - the annual Fairfield Dogwood Festival, which is scheduled for May 11-13. The popular festival, celebrating its 83rd anniversary this year, is held on the grounds of the Greenfield Hill Congregational Church, just two block from this house. Built in 1951, this gray expanded and renovated Cape Cod-style house with blue shutters and white trim offers the charm and quality of yesteryear with today’s modern amenities. The front-to-back formal living room has original period details while the flooring comprises a more contemporary curly cherry hardwood. It is attractively sited on its level property behind a fieldstone wall and split rail fence. Although the address is on Old Academy Road and the house faces that street the driveway is accessed on Redding Road. There are stone steps that lead to the front entrance but more often than not people enter the house from the covered side porch near the driveway. This entrance has a Brazilian IPE porch and a Dutch door that accesses the family room and kitchen, and a decorative sign refers to this area of the house as the Bluebird Café. At the formal front entrance the door is topped by a transom of multiple glass panes. The front façade of this house is adorned in decorative molding; dentil molding along the roofline and the front door is framed by flush fluted columns. Off the entrance foyer is a door into a first floor bedroom and the living room. A pass-through between the bedroom and eat-in area of the kitchen contains a full bath and closet. In the living room there is paneling on the lower walls, chair railing, and an over-sized wood-burning fireplace with a wood storage cabinet. The deliberate coloration choices for the walls in this room and others leans away from monochromatic grays and toward earth tones, which are coming back into vogue. The living room is open to the formal dining room, where there is recessed open shelving in one wall for displays of family photographs or culinary ware. The spacious gourmet kitchen is as elegant as it is functional. It features a large center island/breakfast bar, honed Verde Esmeralde granite counters, a farm sink, commercial-grade appliances, and a large L-shaped built-in banquette. Some of the cabinetry has glass-front doors and interior lighting. The kitchen is open to the family room, which features custom cabinetry and French doors to the patio. Outside, there is a grill area that is connected to the gas line, and fieldstone sitting walls. The mudroom near the side entrance [provides access to the attached two-car garage. Off the living room on the opposite side of the house there is an office with paneled walls painted white, a wall of built-in bookshelves, cabinets, and desk area, and French doors to the patio and yard. A panel was designed to conceal computer and telephone wires. The long counter, including the desk area, features white mosaic tiles. The master bedroom suite is also found on the first floor. It has a deep tray ceiling, two walk-in closets, a cedar closet, two additional closets, and a tall bay window sitting area that looks out across the meadows. This room also provides access to the attic. The large and luxurious spa-like marble bath has a steam shower, double vanity, claw-foot soaking tub, and water closet. Two more bedrooms and a full bath are found on the second floor. The finished lower level features built-ins and provides the perfect space for a playroom, gym, man cave or more, the listing agents said. 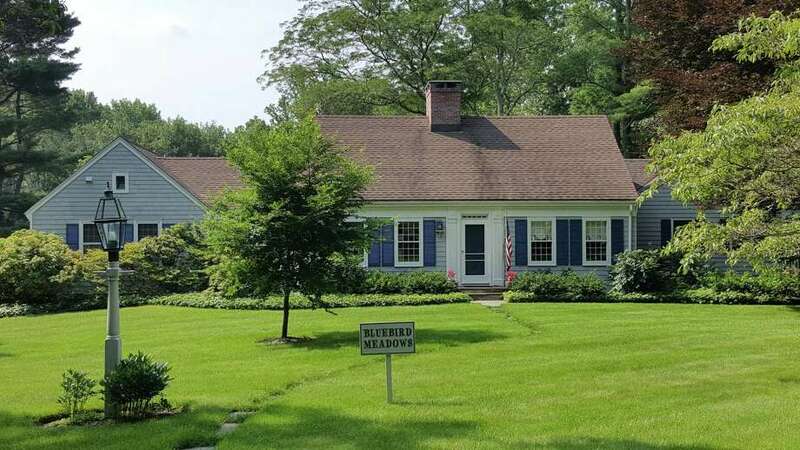 For more information or to set up an appointment to see the house, contact Julie Vanderblue and Lori Auerbach of the Vanderblue Team/Higgins Group Real Estate; Vanderblue at 203-257-6994 or Julie@Vanderblue.com, and Auerbach at 646-734-3514 or Lori@Vanderblue.com.